Happy New Year dear vegan community!! I haven’t posted anything since my birthday in September. I’ve been busy cooking and baking for the last 5 months. In fact, I was so busy cooking and baking, and learning restaurant business, that I couldn’t find any moment to post until now. 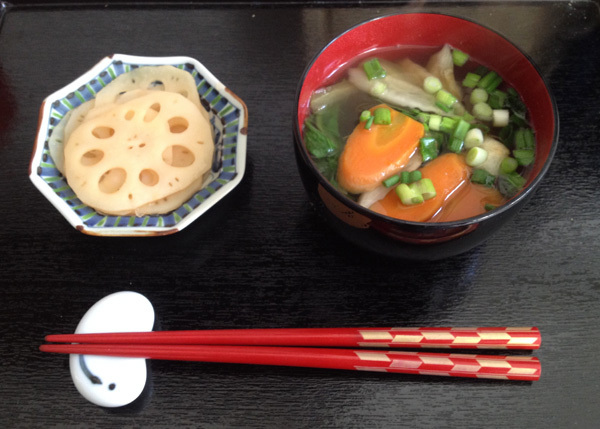 This is an abbreviated version of a traditional Japanese first New Year’s meal. I had this at noon on the New Year’s Day, yet it was the first meal of 2017. I love love Japanese black beans simmered with tamari and sugar. They are so good and sweet. They are my favorite dessert. OMG! This was so good and so easy. And can be quick, too, if you have a pressure cooker. The BBQbean recipe came from the Thug Kitchen. I didn’t bother to make Baked Spanish Rice. I had roasted kabocha pumpkin and steamed sweet potato that I incorporated here. An awesome recipe. A can of chipotle pepper in adobo sauce is used, which is kind of cheating, but hey, it’s a secret that everybody knows. Chop onion roughly. Peel and crash garlic cloves. Put all of BBQ beans ingredients except beans in a blender or a food processor, and run it until the sauce becomes smooth. Heat the sauce in a medium pan until it becomes bubbly. Add cooked pinto beans. Cook additional 5-10 minutes. Pile each ingredient on a plate. Enjoy! 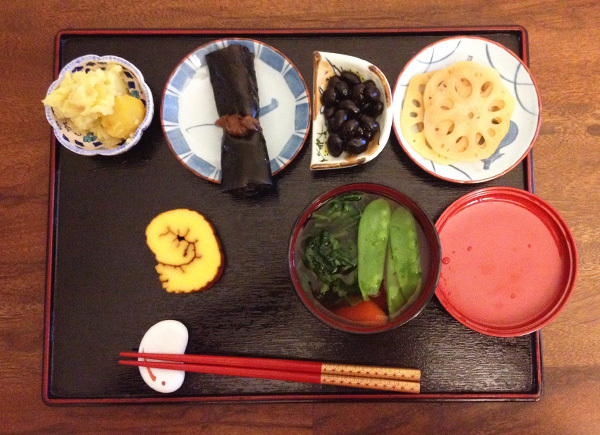 This year, I didn’t make any Osechi Dishes… There was no guest. But still I whipped up a quick Ozoni with a burdock root, a carrot, and bok choy. 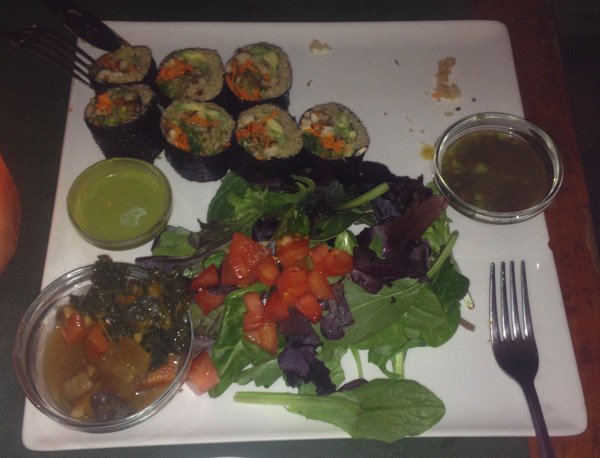 I had an expiring groupon at Quintessence to use, so I went with M. It was packed at 7 p.m. on a cold Tuesday night. Who else wanted to eat raw food on a cold night? East Villagers’ dinner time is after 8 p.m. What happened to that?? We were told that it was a 30 minutes wait. A waitress took M’s phone number. We walked around. 40 minutes in, we got a call letting us know our table is getting ready. When we walked in, we were told to wait outside (again) until she set up the table. But it was 16 ºF outside… I asked her if we could wait just by the door. She said NO. She was firm. We went outside and watched her set up 2 tables rather slowly fiddling napkins’ positions a few times. It’s a tiny space, so that I understand that she needed space to work, but she didn’t make me feel welcomed. When we were finally seated, it was 7:52 p.m.
We ordered 3 appetizers (Caprese Pocket, Gochuchang Fofu, Taco) and a Sushi Roll Dinner. They were all very good and that put a smile on my face. We were hungry and I ate as much as I could, but we couldn’t finish the sushi rolls and no space for deserts left. Gochuchang Fofu was creamy and kimchi-spicy. Caprese Pocket was refreshing, creamy and pesto-y. Taco was not a regular taco. 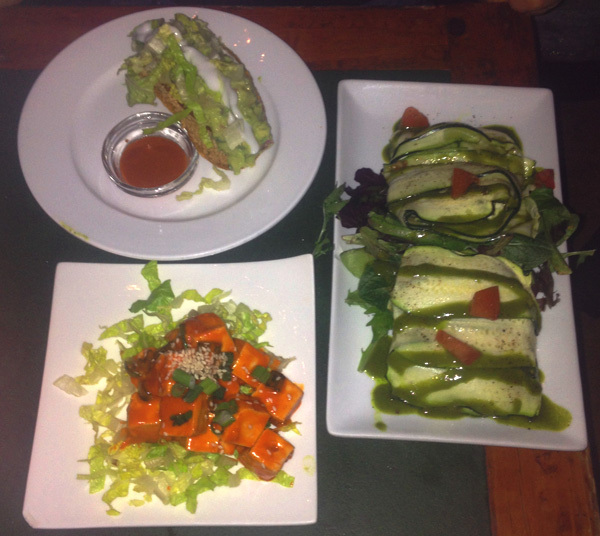 It contained plenty of guacamole and something grainy and hummus like paste in a sweet hard shell. Since our last visit on Valentine’s Day in 2013, Quintessence has changed their menus. They are no longer raw food only. They took off Creamy Curry Plater which M loved, but added quite a few cooked dishes. They still have enough raw dishes. When winter wind blowing outside, I would like to have something warm and yummy, comfort food. This is the comfort food in the oven. I made a double batch of tomato sauce a few days ago thinking of making this. Make tomato sauce. Splash olive oil in a large sauce pan, cook chopped onion, garlic, and vegetables for 5 minutes or until they become soft. Shake in salt and spices. Coat the vegetables. Squash tomatoes in the can, add them to the pan. Add wine and tomato paste as well. Heat to boil. Reduce heat to simmer for 20 minutes. Make tofu filling. Drain tofu. Mix all the tofu filling ingredients until smooth by a mixer or blender. Assemble. In a deep baking dish, spread 1/4 tomato sauce. 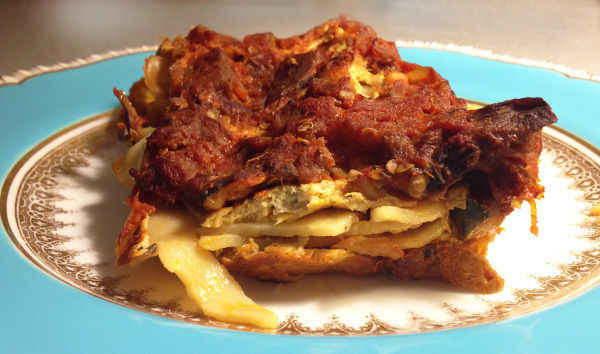 Place 1 layer of lasagna pasta. Spread 1/3 tofu filling. Repeat until the dish is full. I usually use 3/4 box of pasta and run out of other ingredients. End with tomato sauce on top. Cover with a foil. Bake for 30 minutes. *You can sprinkle vegan faux parmesan on top for more cheesiness and crunch. Grind cashew:walnut/pecan:sesame seeds:nutritious yeast=1:1:1:1 in a coffe grinder. Mix in salt and black pepper to taste. This is totally an abbreviated version, not like the way my Mother used to make, but hey, I’ve cooked something. Each dish represents something you wish for the new year. For example, Kuromame is for ability to work diligently. For others, I forgot.